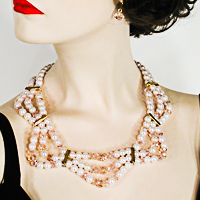 Beautiful soft pink pearls with pink crystal beads make this a special necklace. Rhinestone bars provide loops with the three rows. Set includes matching crystal earrings. Color: light pink. Hue: barely pink. color code: #FFE5E6. Type: gold. 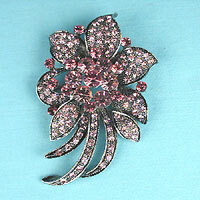 Measurements: width 1½", length 18-20"
Large crystal rhinestone flower pin and pendant combination with leaves and ribbons. Color: pink. Hue: pink. color code: #FF97D4. Type: pewter. Measurements: width 1-3/4", height 1-7/8"
This is an asymmetrical pink and clear extra largesStatement crystal rhinestone bib necklace earrings set. Color: pink. Hue: pink. color code: #FF97D4. Type: silver. 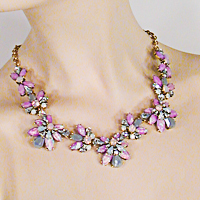 Measurements: width 3", length 21"
Large statement necklace with Champagne, peach, and clear stones in a flower design. Set in gold this beautiful bib necklace is large and dramatic. Color: peach. Hue: apricot. color code: #FFC365. Type: gold. Measurements: width 1-3/4", length 18-21"
These are segment necklaces fashioned with faux moonstone and faux opal stones and rhinestone accents. The segments are made up of different shapes and sizes. They are connected with gold links on a gold chain. Color: lavender. Hue: deep lavender. color code: #C197FF. Type: gold. 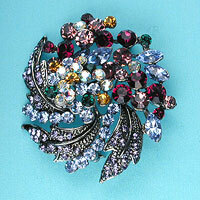 Measurements: width 1.12", length 18.5-20.5"
Large crystal rhinestone brooch in a swirl flower and leaf design. 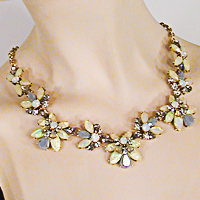 Measurements: width 2-1/4", height 2-1/8"
Large fringe bib necklace fashioned with crystal rhinestone medium round stones, small flowers, leaves and loops of silver set with tiny stones. Color: light blue. Hue: Fog. color code: #D6DBF2. Type: silve. 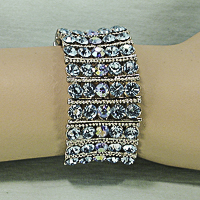 Measurements: width 3-1/4", length 21"
Wide aqua and AB rhinestone bracelet. 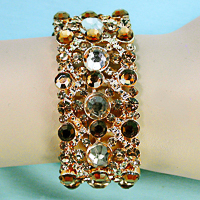 This bracelet has panes of rhinestones which are five wide. The center rhinestone is AB and the others are aqua. It is set in a silver tone band. Long necklace with double strands large and small beads in several textures. Large beads alternate with lengths of small beads. Both strands have a large bead group at the bottom. Color: yellow. Hue: yellow. color code: #FFFF00. Type: gold. Rich gold and amber crystal rhinestone bracelet set in gold tone metal. This bracelet is made with metal sections strung together with invisible elastic cord. The foreground has larger Champagne and amber crystals with gold metal and gold crystals in the background. Color: gold. Hue: soft gold. color code: #CCCD65. 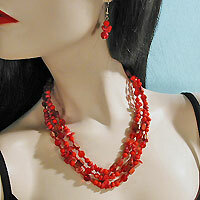 Measurements: width 2½", height 1-1/4"
Beaded necklace and earrings set fashioned in three strands with semi preious look stones and facete rhinestones. 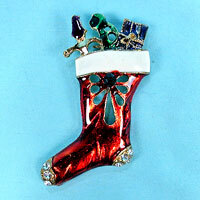 Measurements: width 1", length 20"
Christmas stocking with toys and rhinestone toe and heel. 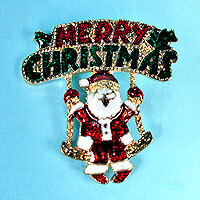 Measurements: width 1", height 2½"
Swinging Santa with Merry Christmas Sign. Color: red. Hue: vermilion. color code: #FF3300. 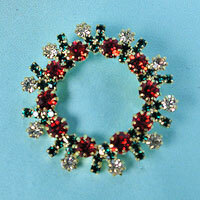 Measurements: width 1-3/4", height 1-3/4"
Rhinestone wreath pin with red, gree and clear rhinestones. 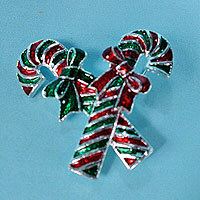 Measurements: width 1½", height 1½"
Red and green candy canes pin for Christmas. Color: red. Hue: cherry. color code: #FF0033. Type: silver. 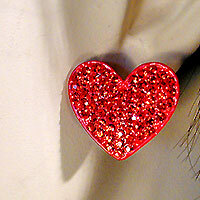 Measurements: width 1", height 1"
Heart crystal rhinestone earrings in a silver setting. 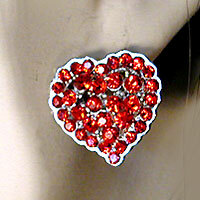 Measurements: width 3/4", height 3/4"
Small crystal rhinestone heart earring. Measurements: width 1/2", height 1/2"
Semi hoop earrings fashioned with red, and small iridescent stones with gold bars in between. Color: red. Hue: red. color code: #FF0000. 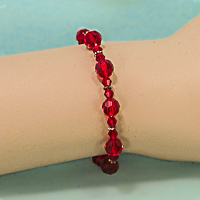 Measurements: width 5/8", height 7/8"
Sparkling beaded bracelet with small and medium faceted glass beads and metal spacers. It is strung on an elastic cord for easy access. Vintage look crystal rhinestones watch. 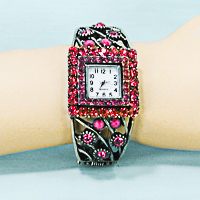 This beautiful timepiece is fashioned in a rectangular design with two rows of rhinestones around the face. The outer row is a slightly darker shade. The band is done in scrolled antique look brass with rhinestone accents. A beautiful watch to add bling to casual clothes and glamor to an evening ensemble. Color: red. Hue: deep red. color code: #9C003E. Type: brass. 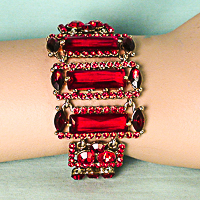 Brilliant red bracelet with 3 oblong gold panes set with large long emerald cut and small oval crystal rhinestones. These are bordered by rectangle panes and medium round stones. All panes are surrounded by tiny stones. It has a adjustable chain back with lobster claw clasp. 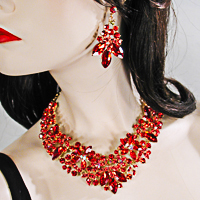 Measurements: width 2-3", length 19"
Large segment crystal rhinestone necklace and earring set. The segments in this set are fashioned in fans of small and large marquise rhinestones topped with smaller round stones. They are hinged together with rings for a comfortable fit. 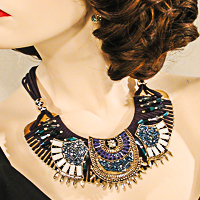 These statement necklaces are worn for evening and with open shirts for daytime. 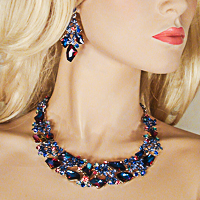 Measurements: width 1-1/4", length 17-23"
Large segment crystal rhinestone bib necklace and earring set. The segments are fashioned in flowers and leaves made from large marquise and small round stones. The seven segments are are hinged together with rings for a comfortable fit. This is a beautiful necklace dense with color. 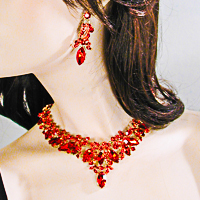 Measurements: width 1-3/4", length 15-23"
Beautiful bib necklace and earring set fashioned with marquise and round crystal rhinestones and enamel filigree. The design is made from large marquise stones and small round ones. They are surrounded by and enamel filigree design. They are both pretty and delicate. 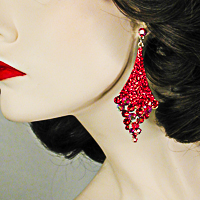 Measurements: width 2", length 15-18"
Extra large long crystal rhinestone drop earrings with pave and medium round stones. The larger stones are both solid color and iridescent. Measurements: width 1-1/4", height 3-1/4"
Striking bib necklace and earring set fashioned with crystal rhinestones and filigree. This necklace has both small round rhinestones and large marquise stones that come to a point in the center. Great necklace to add splash to any outfit. 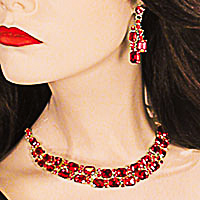 Measurements: width 1½", length 21"
Measurements: width 1-3/4", length 20"
This is a sparkling crystal rhinestone necklace with a unique elegant design. The necklace is fashioned with two rows of emerald cut stones separated by two round stones. It is 17 inches in length with a 3 inch extender. 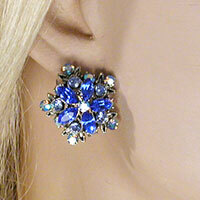 The matching drop earrings are 1 and 7/8 inches long and 5/8 inches wide. It is a beautiful set suitable for any occasion. 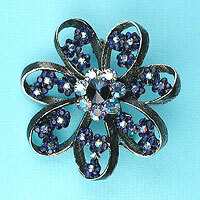 It is ideal for wedding, engagement, graduation, party, prom and daily wear. Measurements: width 5/8", length 17-20"
Extra large pointed bib necklace fashioned with cube crystals and round rhinestones. A wavy gold wire completes the design. This is a unique and elegant set. Color: crimson. Hue: crimson. color code: #FF5E33. Type: gold. 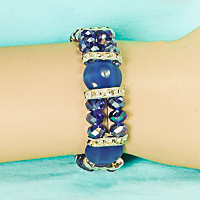 Measurements: width 2½", length 21"
Crystal rhinestone stretch bracelet in an openwork design. Color: hot pink. Hue: hot pink. color code: #FF97AB. Type: si. 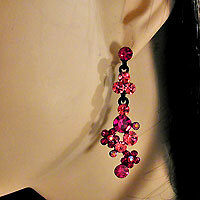 Drop earrings in fuchsia and pink fashioned in clusters. 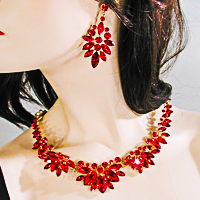 Measurements: width 3/4", height 2"
Pointed bib necklace and earring set fashioned with crystal rhinestones and enamel filigree. This necklace has both small round rhinestones and large marquise stones the come to a point in the center. Its an elegant necklace to wear in the evening or daytime. Color: fuchsia. Hue: fuchsia. color code: #FF0099. Type: gold. 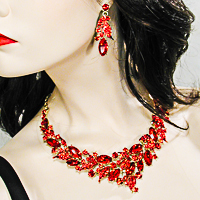 Measurements: width 1-3/4", length 18-20"
Sensational large crystal rhinestone bib necklace and earring set. These beautiful necklaces feature large marquise, pear and round stones. The colored stones are iridescent and reflect several colors depending on the angle of the light. They comes in several colors: royal with purple highlights, turquoise with blue highlights, teal with blue highlights, purple with blue highlights, peach with lavender highlights, multi colored, clear and black. They are fashioned in an open work design with a large drop pear stone in the center. They are made with segments which move with you but lay flat. The matching earrings are designed with the same stones. 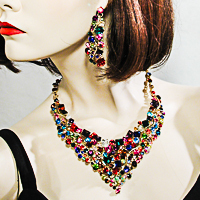 Measurements: width 2", length 20"
Crystal rhinestone clip earrings fashioned in a round design with five points using colored and iridescent stones. Color: blue. Hue: pacific blue. color code: #0066FF. Beautiful blue bracelet with medium blue round cabochon stones, small faceted iridescent blue stones in double strings of three each and silver separators with clear crystal rhinestones. The bracelet is strung on stretch nylon filament which goes over the hand easily but is not tight on the wrist. Color: blue. Hue: pacific blue. color code: #0066FF. Type: silver. 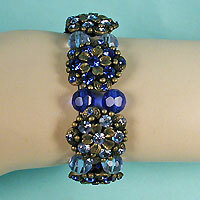 Measurements: width 3½", height 3/4"
Wide 5-line crystal rhinestone bracelet with light blue, royal and navy stones. This is a stretch style with stones set in silver tone metal and arranged in diagonal stripes. 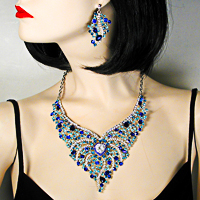 Statement bib necklace and earring set fashioned in rhinestones and enamel filigree. The design includes small rhinestones on enameled vines and large rhinestones in a modified rectangle and oval shape. A really unusual necklace to wear for evenings and parties. 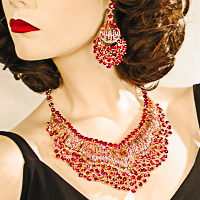 Measurements: width 1-1/4", length 17-19"
Striking bib necklace and earring set fashioned with crystal rhinestones and enamel filigree. This necklace has both small round rhinestones and large marquise stones the come to a point in the center. Great necklace to add splash to any outfit. Measurements: width 1½", length 16-18"
This is a segment necklace fashioned with faux moonstone and faux opal stones and rhinestone centers. They are connected with gold links on a gold chain. Color: blue. Hue: Sky. color code: #65C0FF. Type: gold. 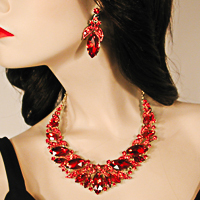 Measurements: width 1", length 17-19.5"
Large bib statement necklace with solid and clear crystal rhinestones. This necklace is fashioned with large marquise, emerald and round cut stones along with small and medium stones. A ribbon of clear stones is woven through for accent. Color: sapphire. Hue: sapphire. color code: #3300FF. Type: silver. Measurements: width 2", length 20-23"
Large crystal rhinestone pin in a loop design with small flowers and a larger center flower. Color: royal. Hue: royal. color code: #0000FF. 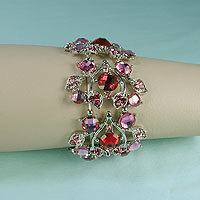 Measurements: width 2-1/4", height 2-1/4"
Antique silver look stretch bracelet with faceted beads and crystal rhinestones. 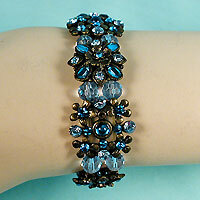 Measurements: width 3/4", length 8"
Light and dark rhinestones and beads on an antique stretch band. 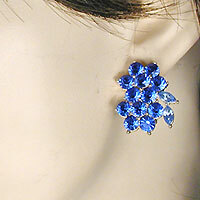 Small cluster clip earring with round an marquise stones. Color: royal. Hue: copenhagen. color code: #3385FF. 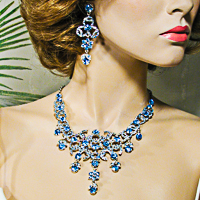 Measurements: width 3/4", height 1"
Exquisite blue, turquoise and clear crystal rhinestone bib necklace and earrings set. 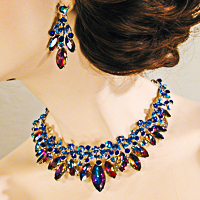 Necklace is fashioned in a spray of rhinestones in alternating colors. The center stone is a clear heart surrounded by small royal blue round stones. Matching stud earrings measure 2-1/4 inches in length. Color: royal. Hue: royal. color code: #0000FF. Type: silver. Measurements: width 3-1/4", length 20"
Large bib tribal necklace and earring set. This fabulous necklace includes metal, beads, a rhinestone and leather cord. 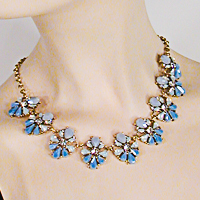 It is a contemporary statement necklace and will add pizzazz to your outfit. Measurements: width 2-1/4", length 20-23"